From 2 – 4 March I was guiding a private battlefield tour. Late last year I had been asked to compile a report on S/8888 Private William Charles Sewell who served in the 2nd Battalion Seaforth Highlanders. William Sewell went overseas in November 1915, served through the Somme in 1916 and was killed at Roeux during the Battle of Arras on 3 May 1917. As well as compiling a detailed report on William Sewell’s war service I was asked to take his great nephew, Paul Carter with his friends to follow in William’s footsteps from Arras down to the Somme. 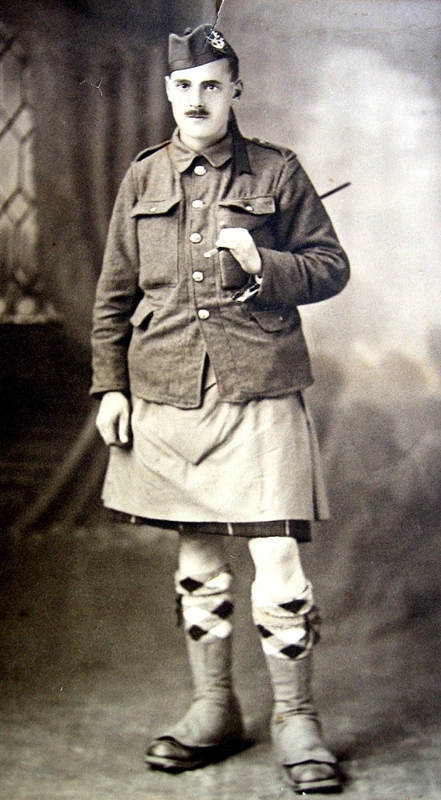 Private William Charles Sewell, 2nd Battalion Seaforth Highlanders. Killed 3 May 1917 during an attack at Roeux during the Battle of Arras. 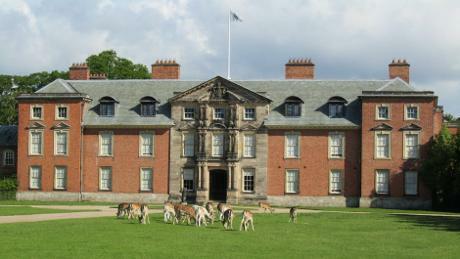 Many thanks to Paul Carter for his permission to use this photo. At ZERO Hour (12 noon) 2nd Seaforths and 1st Royal Irish Fusiliers advanced, the former on a 3 company front, the latter on a 2 company front. The 2nd Seaforth Highlanders’ objective was the cross roads I.13.a.9.3, exclusive to cross roads I.7.a.4.3 exclusive. Immediately these two battalions advanced, they came under a very heavy machine gun fire from the INN, CHEMICAL WORKS, STATION, CHATEAU and Railway Embankment. The whole ground in Squares H.12 and 18 appeared to be swept by machine gun fire. At the same time a barrage was put down on FAMPOUX and East of the SUNKEN Road where the remaining two battalions were assembling. This machine gun fire very soon thinned the advancing lines but the troops continued to advance. On the left, part of a company of the 2nd Seaforth Highlanders entered a new trench some 150 to 200 yards west of the 1st objective, about I.7.c.5.9. 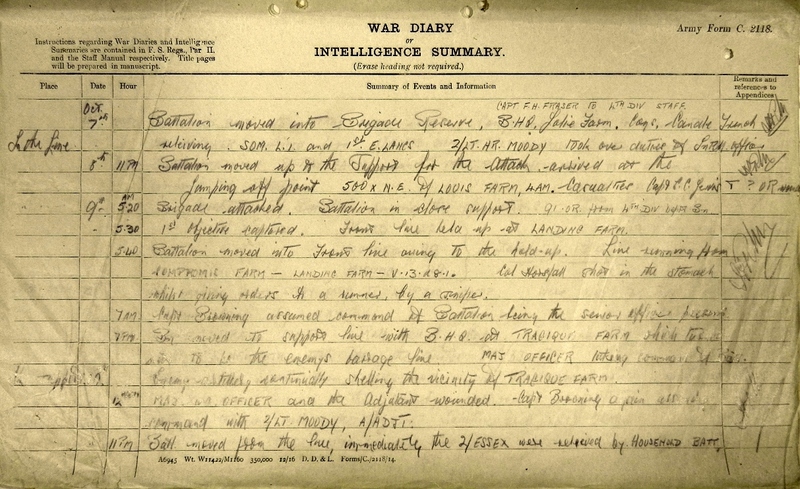 This party under an officer [Lt Donald Mackintosh] maintained itself in the trench for some time, until its ammunition was exhausted, when they were forced back by a counter attack and only a few returned. The remainder, including the officer who is missing, were either killed or wounded, and left in this trench. The heavy machine gun fire maintained by the enemy made it impossible to obtain information regarding the course of the action but it required no report that a single wave of 400 men who had to advance an average distance of 400 yards with a Battalion front of 1100 yards could not obtain their objectives in face of such machine gun fire and rifle fire. 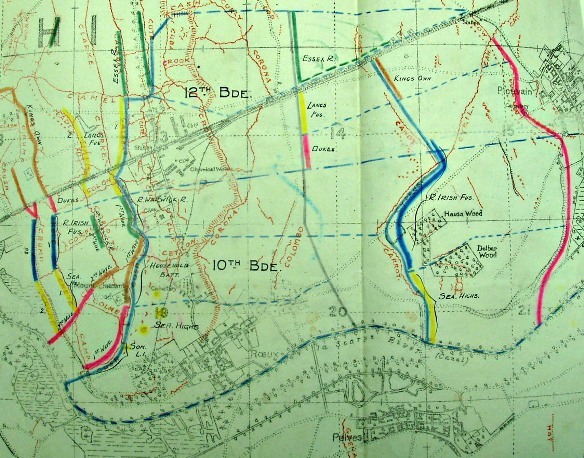 Map extract from 10th Brigade war diary showing 'line of dead Seaforths'. 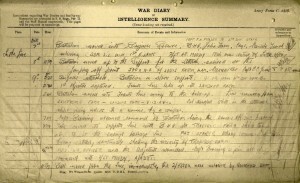 Ref: WO95/1479 10th Infantry Brigade War Diary. Copyright National Archives & reproduced with their permission. The capture of the Northern portion of the village of ROEUX, including the CHEMICAL WORKS and STATION buildings. The piercing of the defences round PLOUVAIN, which were partially wired. 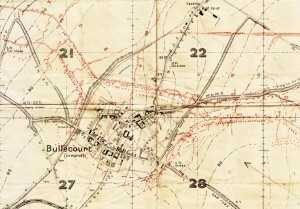 3 May 1917: the 4th Division's attack plan for Roeux . Positions for the 2nd Seaforths can be seen marked in yellow. Ref: WO95/1446 4th Division War Diary. Copyright National Archives & reproduced with their permission. 3 May – Zero hour 3.45am when a heavy bombardment of enemy’s position started, lasting for half an hour. Barrage then crept forward very slowly. 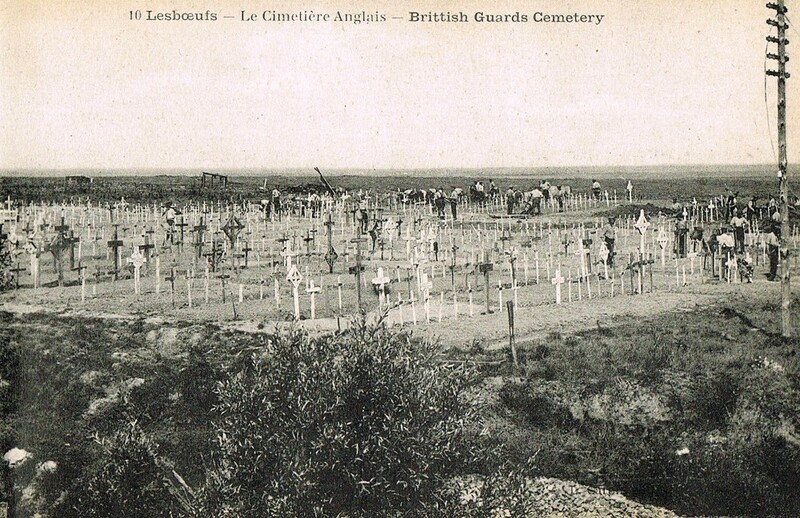 Battalion left their trenches at 4.30am, being in support to the Household Battalion who were to capture the cemetery north of ROEUX. The Royal Warwickshire Regiment were on the left of the Household Battalion and Royal Irish Fusiliers on left of Seaforths, support to Royal Warwickshire Regiment. 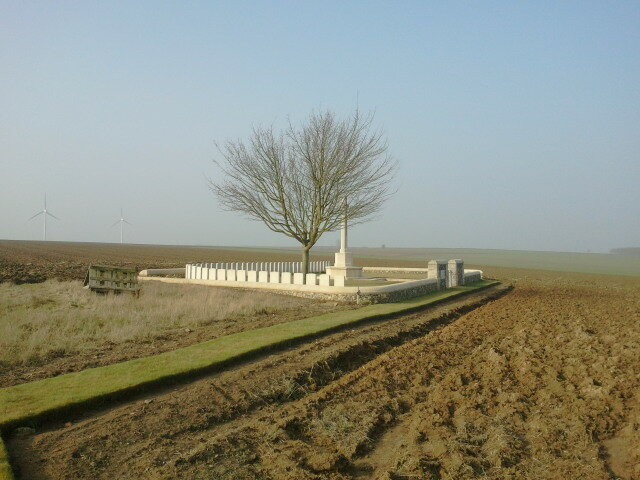 1st Somerset Light Infantry were on the right and were to capture village of ROEUX. 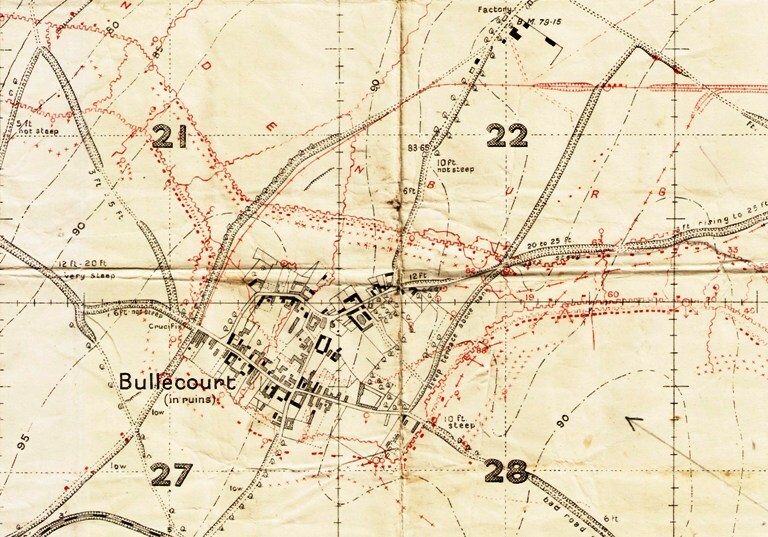 On reaching BLUE Line which was just west of DELBAR WOOD the Battalion moved to their right until left of each wave was opposite NW corner of DELBAR WOOD where a halt was made until ZERO + 85 = 5.10am when they advanced to capture the RED line, east of DELBAR and HAUSA WOOD, and immediately west of PLOUVAIN, through I.21.b. and I.15.d & b. This attack unfortunately failed owing to both flanks being held up and severe losses, and later on the whole Brigade line was forced to withdraw to original front line. The Battalion came back to CRETE Trench. This was the position until dark when the Battalion was sent to relieve the Household Battalion in CEYLON Trench from its junction with CORONA Trench I.19.a.8.7. to its junction with COX Trench I.19.a. 7.3. Company Sergeant Major Fraser was in charge of the line as all officers taking part in these operations had become casualties. The Commanding Officer, Adjutant, Medical Officer and three other officers became casualties of the same shell. Delbar and Hausa Wood no longer exist. Le Lac Bleu (Blue Lake) now covers the ground on which the woods sat. Unless there is specific personal testimony it is notoriously hard to pinpoint the exact spot that a soldier was killed. However, as most casualties were sustained between the BLUE and RED lines it seems likely that William Sewell was killed in this area. Having followed the route of advance we returned to the ground between Fampoux and Roeux to pay our respects at William Sewell’s grave. Crossing the Scarpe we drove up in Monchy-le-Preux and up Infantry Hill where I recounted the story of 14 April attack by the 1st Essex and Newfoundlanders and the resulting action of the small band of men who saved Monchy from German recapture. For our last stop of the day we headed to the Arras Memorial to Missing. Next morning began with a windswept walk on the Hindenburg Line to the quiet delight of Rookery Cemetery and Cuckoo Passage Cemetery, the latter full of men of the Manchester Regiment killed on 23 April 1917. 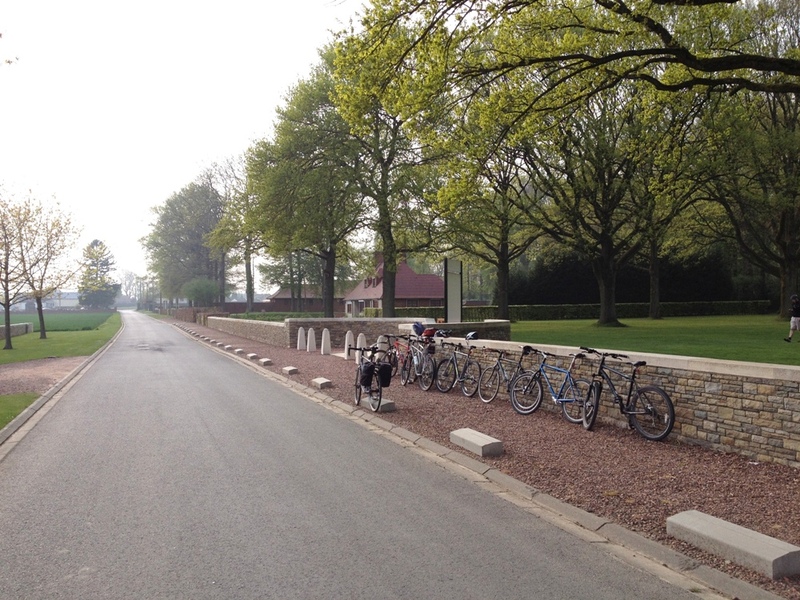 We then headed back into Arras for a good tour of the underground boves and tunnels at Wellington Quarry. 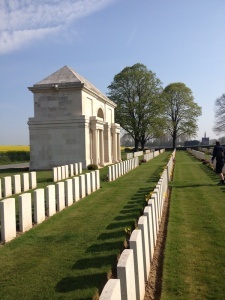 Our brief visit to Arras was now at an end as we headed south down to the Somme battlefields. Zero at 7.30am. From 5.30am the very intense bombardment concentrated on the German trenches in front. At 7.30am the 11th Brigade moved forward from our front in waves. By 8.45am no messages had come through from 11th Brigade. Patrols advanced and were met by heavy machine gun fire. Telephone to Brigade HQ was out so two orderlies were sent for orders. As they had not arrived by 9am – the hour appointed for the Battalion advance – the remainder of the Battalion moved forward. On coming into view of the German trenches the Battalion came under heavy machine gun fire from the front and direction of Beaumont Hamel. After passing the German front, parties pushed forward and reached the third line of trenches. Other parties of our men may have reached Munich Trench but there was no possible communication and none returned. By this time 11th Brigade had already lost their Brigadier, General Prowse (died of wounds) and all four Commanding Officers (killed). Enemy held first, second and third lines on our left and right. Attempts were made to consolidate the ground gained. Enemy bombed on flanks and the third line was given up at about 1pm. 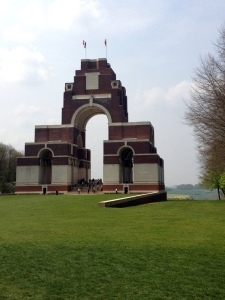 By 11am there were only 5 officers left with the battalion and casualties were proportionately heavy in the ranks. 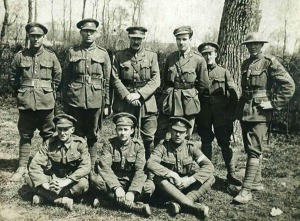 During the evacuation of the third trench Drummer Ritchie sounded the Charge with the idea of encouraging these waverers who had lost their leaders. This gallant action in addition to his conduct throughout the day gained him the Victoria Cross. We finally withdrew at about 5pm to original front line positions south of the Quadilateral. At this time there were about 40 men of the battalion left. 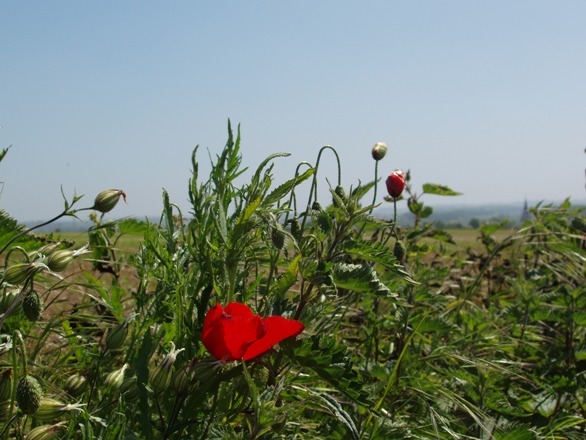 Redan Ridge viewed from a position on the Hawthorn Ridge. 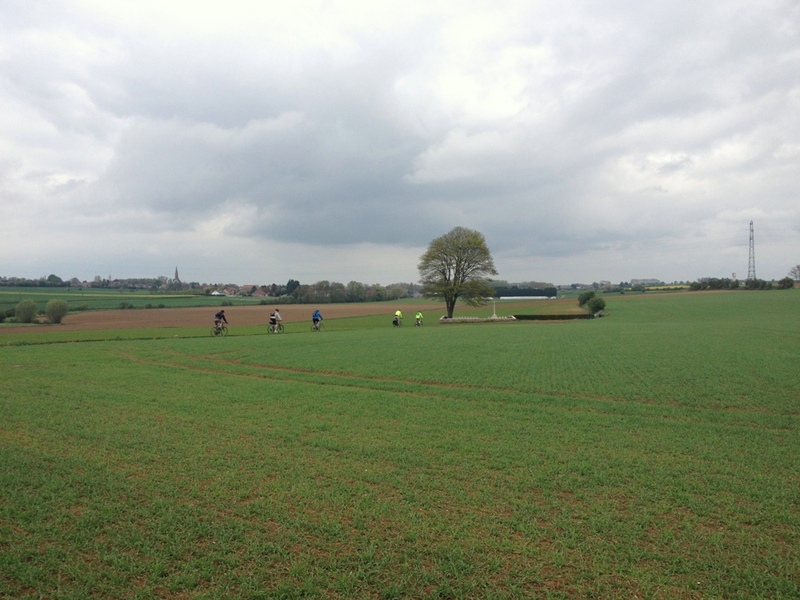 The German-held village of Beaumont Hamel is to the right of frame. 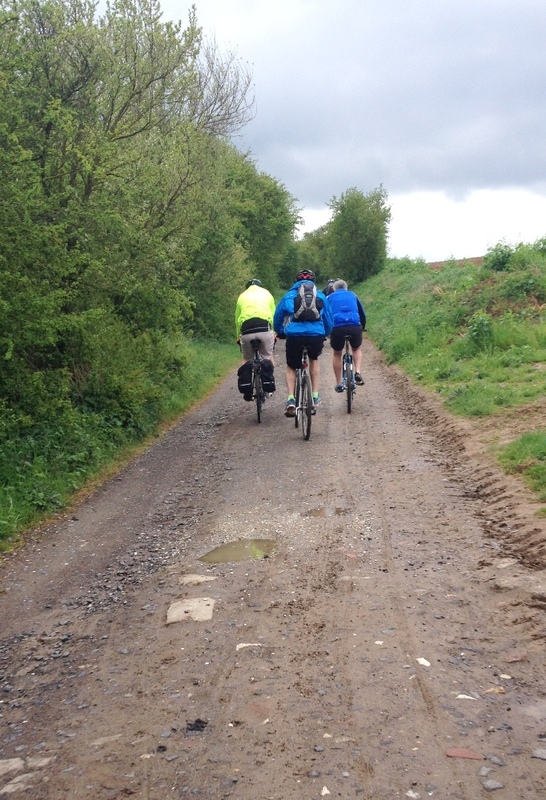 Further stops that afternoon included the Sunken Lane at Beaumont Hamel, scene of the infamous attack by 1st Lancashire Fusiliers on 1 July, Newfoundland Memorial Park with its preserved trenches and the Ulster Tower and Thiepval Memorial to the Missing. 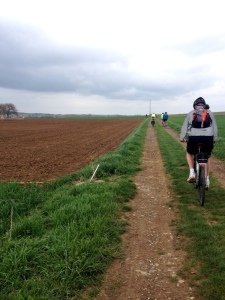 We finished by following the front line by Authuille Wood to Ovillers, down Mash Valley and then to the hotel at Albert. 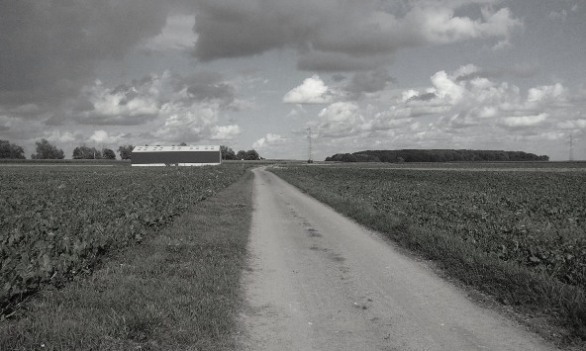 From Montauban eastwards the whole country is one stretch of absolute desolation – a more gloomy sight I have never seen. The ground is just a maze of shell holes, varying from size of stokes mortar crater to the size of a crater made by a 15-inch. The attacks on the 14th and 23rd were pressed with utmost gallantry but typical resolute defence from German troops allied to the dreadful ground conditions encountered made any serious advance impossible. After a walk around Delville Wood and a stop at Flat Iron Copse Cemetery and the Welsh Dragon Memorial at Mametz Wood we ended up at the Glory Hole at La Boisselle where I was able to show them around site and take them underground in W Adit. It had been a real pleasure spending time with these gentlemen. Thanks to Paul Carter and his friends Tim Halliday, Al Kendall and Richard Johnson for making me so welcome. 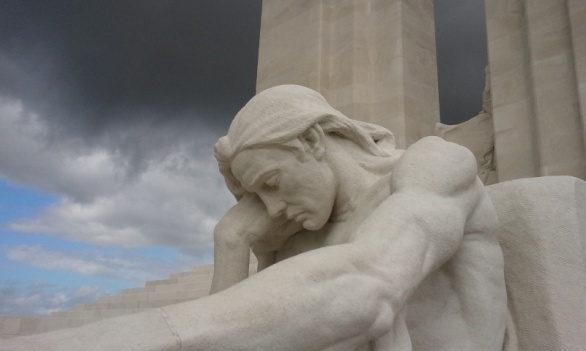 I hope that we can do it again sometime soon – perhaps Ypres next time? 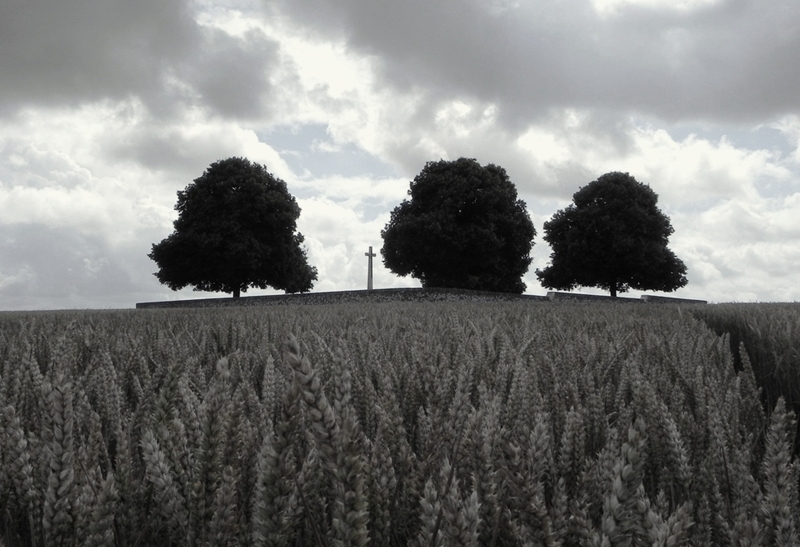 A few weeks ago I took a couple, Mac & Marian from New Zealand, around the battlefields. They had asked me to show them around the Western front for three days before catching a train to Paris for the next leg of their trip. What made this trip so special was that we were following Corporal Andrew McDonald, 6th Seaforth Highlanders. 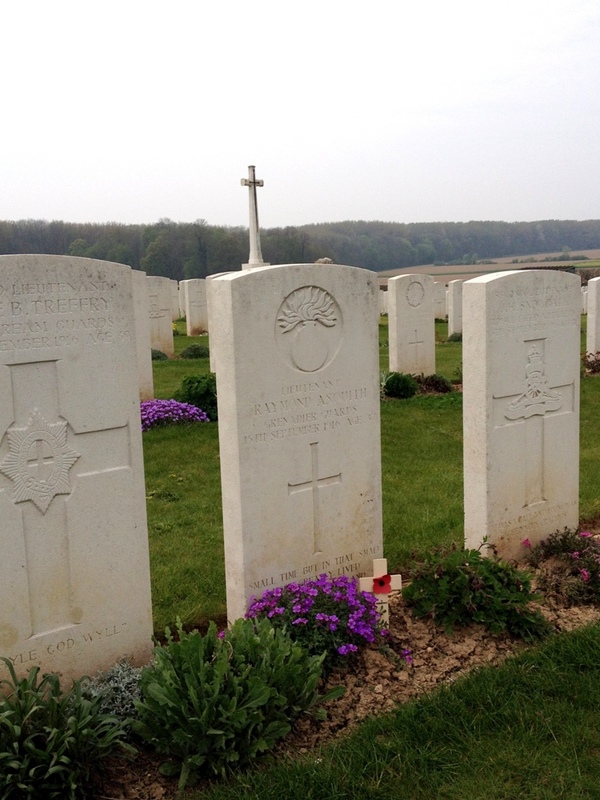 Andrew McDonald died of wounds on 13 April 1917 and is buried at Etaples Military Cemetery. His battalion was involved in the opening stages of the Battle of Arras. It is highly probable that he was wounded when the battalion ‘went over the top’ in front of Roclincourt at 5.30am on 9 April 1917. I had previously written about the area in a piece entitled 6th Seaforth Highlanders at Roclincourt – The Battle of Arras, 9 April 1917. After picking up Mac & Marian at Folkestone we took the tunnel over and then headed along the coast to Etaples. They told me that they had visited Second World War cemeteries before but I could see how moved they were when we pulled up at Etaples. 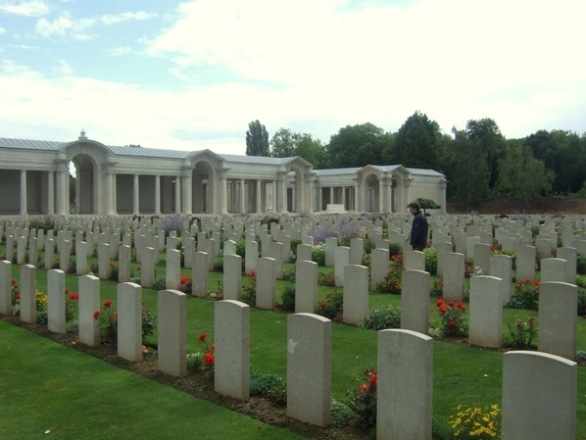 The cemetery, the largest Commission cemetery in France, was designed by Sir Edwin Lutyens. The scale of the place defies belief and really deserves to have more visitors. 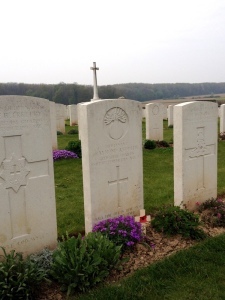 After visiting Andrew’s grave and laying a small cross – something that Mac had been wanting to do for years – we spent a couple of hours just walking around this vast and sobering cemetery – the final resting place for 11,500 men and women. Retracing our steps back up the motorway we headed to Ypres where I took them to various spots around the salient including Pilckem Ridge, Polygon Wood, Robertson’s Bridge at Reutel, The New Zealand Division Memorial at Gravenstafel, Tyne Cot Cemetery and finally the German Cemetery at Langemarck. We headed back to our excellent B&B and then back out to Ypres so we could attend the Last Post ceremony at the Menin Gate. We ate in the square before heading back to the B&B for a good sleep after a long day. The next day was to be spent around the Arras battlefields. 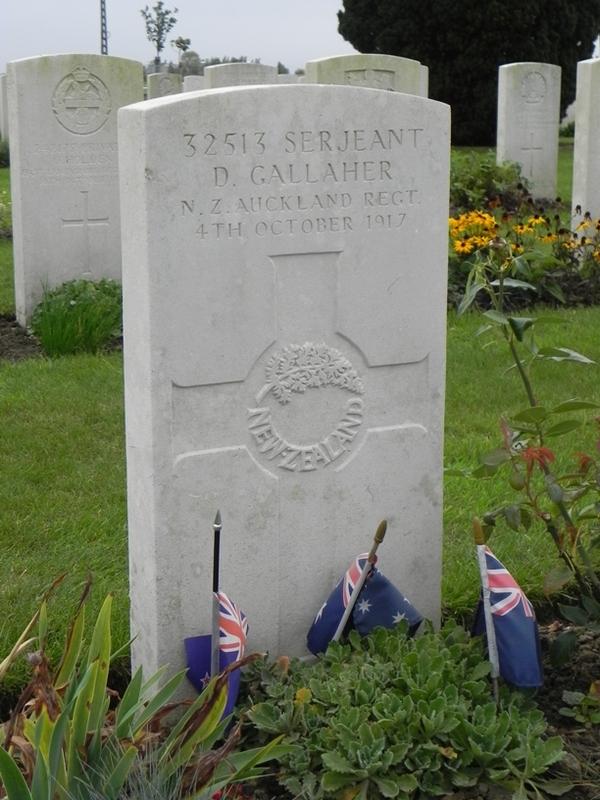 After a mammoth breakfast we set off south, firstly stopping at Nine Elms Cemetery at Poperinghe to pay our respects at the grave of David Gallaher, captain of the All Blacks. We had a quick stop at Peckham and Spanbroekmolen, two of the huge craters formed by the Messines mine explosions on 7 June 1917 before heading south via Ploegsteert and into France to our next stop at La Chapelle-d’Armentières. 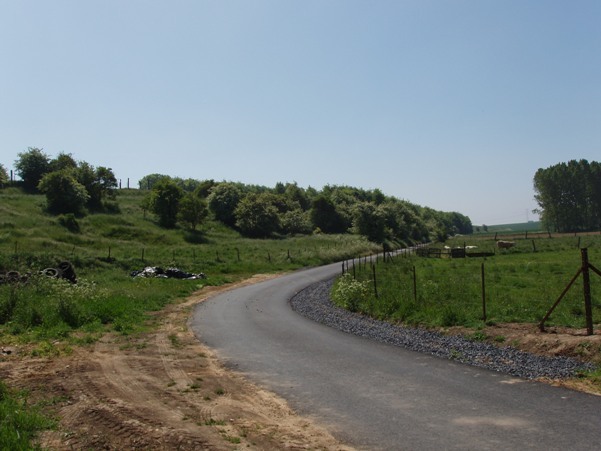 It was here, at the site of the Railway Salient that Andrew McDonald’s brave actions during a trench raid on 15 September 1916 earned him the Military Medal. I was able to stand Mac at a spot looking down the railway line to where the German salient jutted out into No Man’s Land and explain the events of that night. We then continued south, stopping at Noeux-les-Mines Communal Cemetery & Extension to pay our respects at Marian’s great uncle, David Watson’s grave. He had been killed during the Battle of Loos whilst serving with the 1st Battalion, Cameron Highlanders. Leaving the coalfields of Gohelle behind us we began our look at the Arras battlefields. I started with a stop at the village of La Targette with its staggering French and German cemeteries. If ever there is a place to fully appreciate the extent of losses suffered by our French allies and German foe then this is it. 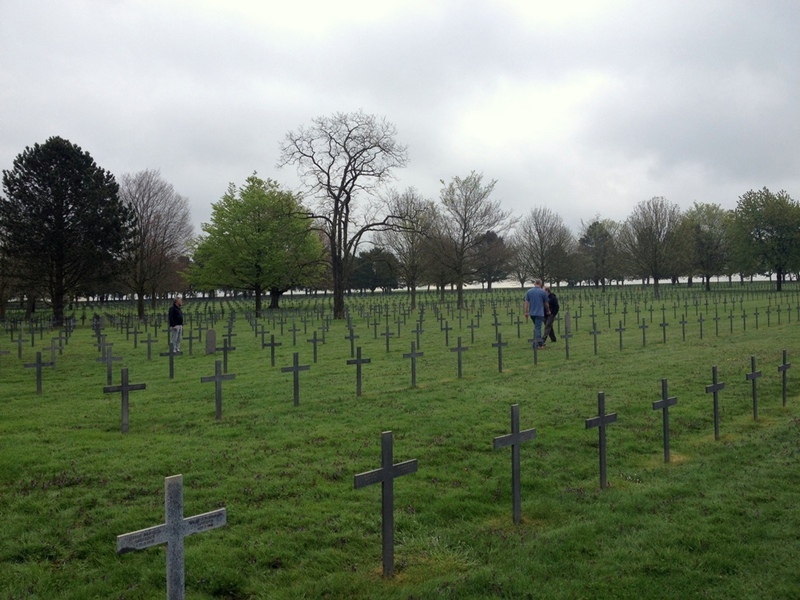 Neuville St Vaast Soldatenfriedhof has over 44,000 German buried within its grounds – a truly sobering place. We then headed to Vimy Ridge where, after a tour of the trenches, we headed to Walter Allward’s magnificent Vimy Memorial. 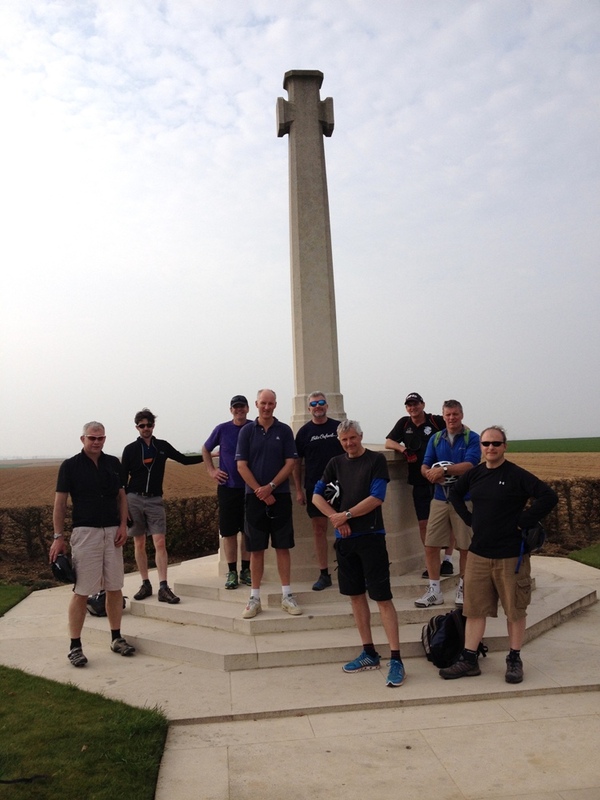 Next up was a special visit to the exact spot outside Roclincourt where ‘C’ Company, 6th Seaforths attacked on 9 April 1917. 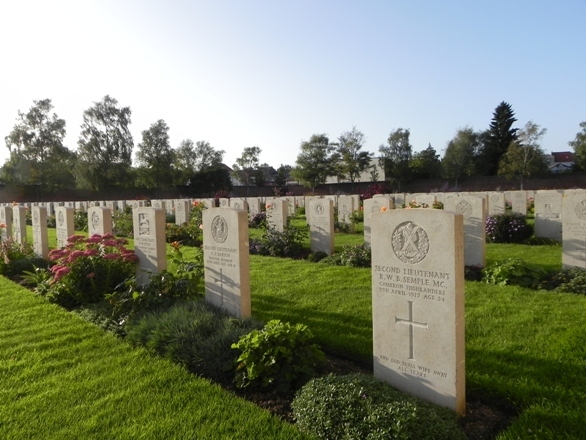 It was in the fields between the British front line and second German line (the area now contains the beautiful Highland Cemetery) that Andrew McDonald most likely received his fatal wound. After an emotional stop at Highland Cemetery to visit other 6th Seaforth men we continued our tour through St Laurent Blangy and Athies to the Seaforths Cross at Fampoux. We then headed to the infamous village of Roeux (heavily fought over by the 51st Division in April and May 1917) and crossed the Scarpe to Monchy-le-Preux, Infantry Hill and then back down the Arras-Cambrai road to the superb Carrière Wellington tunnels. Our final stop of the day was at the Faubourg d’Amiens Cemetery & Arras Memorial to the Missing where, bathed in evening sunlight, we wandered at our leisure. After a meal in the Grande Place we headed off for a much-needed sleep. 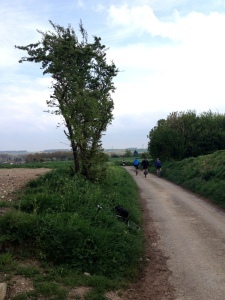 The following morning saw us continue south down to the hallowed ground of the Somme battlefields. Mac & Marian had asked for unusual stops so, en route, we stopped at the quiet Ayette Indian & Chinese Cemetery. Continuing south we visited Sheffield Memorial Park at Serre where I explained about the destruction of the Pals battalions of the 31st Division on 1 July 1916, the First Day of the Somme. We then headed over the Redan Ridge to Beaumont Hamel where, as well as looking at the disastrous attack by 29th Division troops on 1 July I gave a detailed explanation of the 6th Seaforth’s role in 51st Division’s successful attack on the village bastion on 13 November. 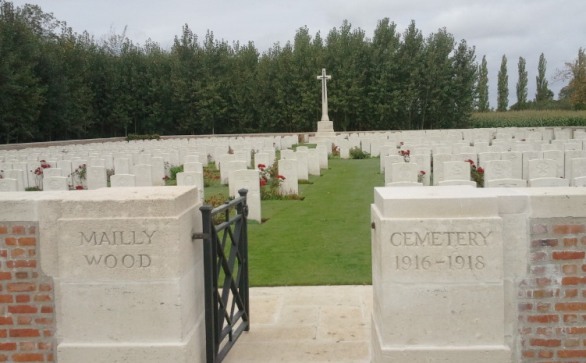 We then visited Mailly Wood Cemetery to visit the graves of 6th Seaforths men killed in that attack. 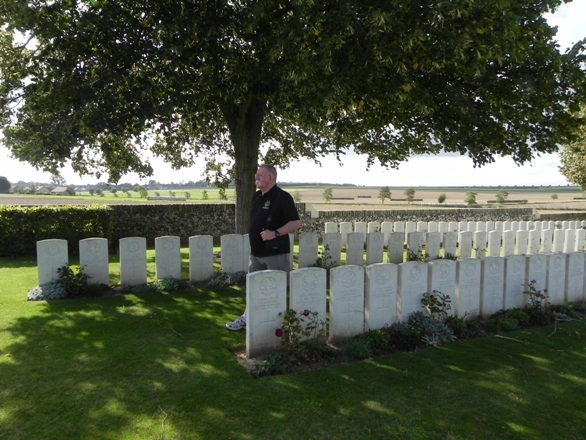 Most notably I had wanted them to visit the grave of 2/Lt Donald Jenkins MC. He had won his Military Cross in the same raid that earned Andrew his Military Medal – in fact, both men had crossed No Man’s Land three times bringing back wounded men on each occasion. 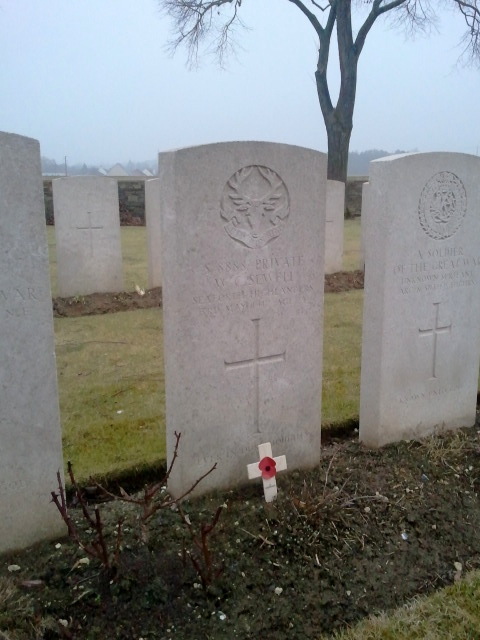 Undoubtedly, despite the officer/other rank divide there would have been some connection between Andrew and this officer now lying at peace in Mailly Wood Cemetery. Other stops that afternoon included a good stroll around Newfoundland Memorial Park, the Ulster Tower and Thiepval Memorial to the Missing. Having stopped at Mash Valley I took Mac & Marian on a private tour of the Glory Hole at La Boisselle (http://www.laboisselleproject.com/) before our final stops of the day at the Caterpillar Valley Cemetery for the New Zealand Memorial to Missing from September/October 1916 and the New Zealand Division Memorial at Longueval. 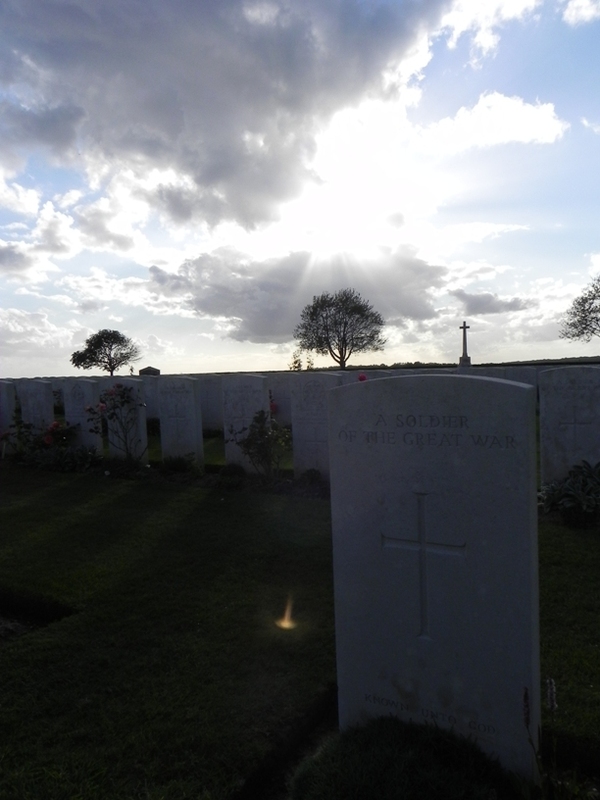 Early evening at Caterpillar Valley Cemetery. A ray of sun pierces through the clouds to strike the ground. Passing High Wood I was able to point out the position of Seaforth Trench, dug by 6th Seaforths in July 1916 before heading off to our B&B at Flers for a well deserved beer, meal and chat. 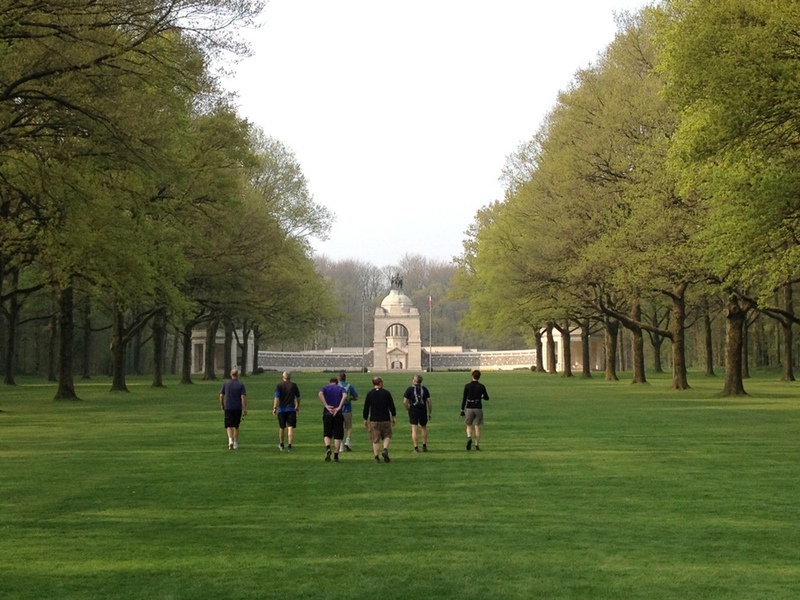 The final day dawned with beautiful sunshine and so, rather than dropping Mac & Marian off in Amiens as had been agreed, I took them just down the road to Delville Wood and the South African Memorial. We were the first ones to visit that day and the atmosphere and light were quite superb. After a circuitous tour to Ginchy, Guillemont and Montauban I stopped at the site of the Carnoy craters to tell them about the successful use of the Livens Large Gallery Flame Projectors employed there on 1 July 1916. Moving on to Amiens, we visited the splendid cathedral before I bade them a fond farewell at the railway station. It was another trip to be remembered with lovely people – thanks Mac & Marian for making it such a great time for me too. “Thank you for a fantastic trip in September 2011. We were lucky enough to travel with you for three and a half (far too short) days and experience your enthusiasm and passion for WW1 and the Somme first hand. We needed a lot longer. On your website you mention Corporal Andrew McDonald. He is my husband’s Great Uncle lost in 1917. During our time with you he came back to life and it was marvellous to be able to tread the same ground that he walked and to see similar sights. The report that you provided to us will hopefully inspire some other family members to travel to France and Belgium and to utilise your knowledge and enthusiasm for the Western Front and the Somme. 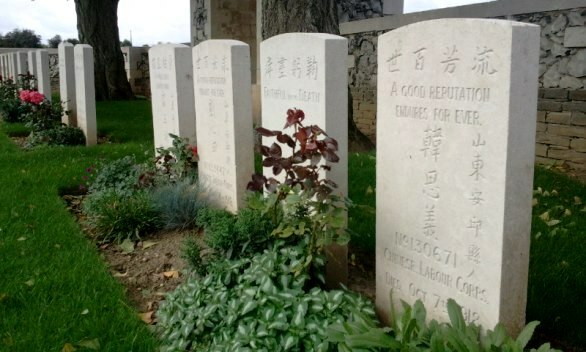 You were willing to take us out of our comfort zone and show us areas, memorials and cemeteries that we had no idea could exist from the smallest to the largest including German, Indian, Chinese, Kiwi, Aussie, French, British, South African, Canadian etc. More than we had hoped for or realised that we would have ever seen. Thank you for your ability to generate interest and create great memories. Last week I spent an enjoyable two days on the battlefields with four clients. For all but one of them it was their first visit to the western front. 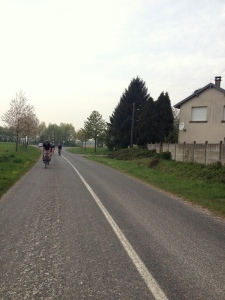 We met bright and early on Monday morning at the Channel Tunnel terminal and travelled over in convoy down to Arras. Our first stop was in the superb Carriere Wellington. Our guide, the irrepressible Pascal, was as keen as ever and coupled with my preliminary talk on the Battle of Arras and the ten minute ‘taster’ film shown prior to going underground my group got a good initial grasp of the battle in April & May 1917. Following our hour underground we visited the Arras Memorial to the Missing and Faubourg d’Amiens Cemetery. 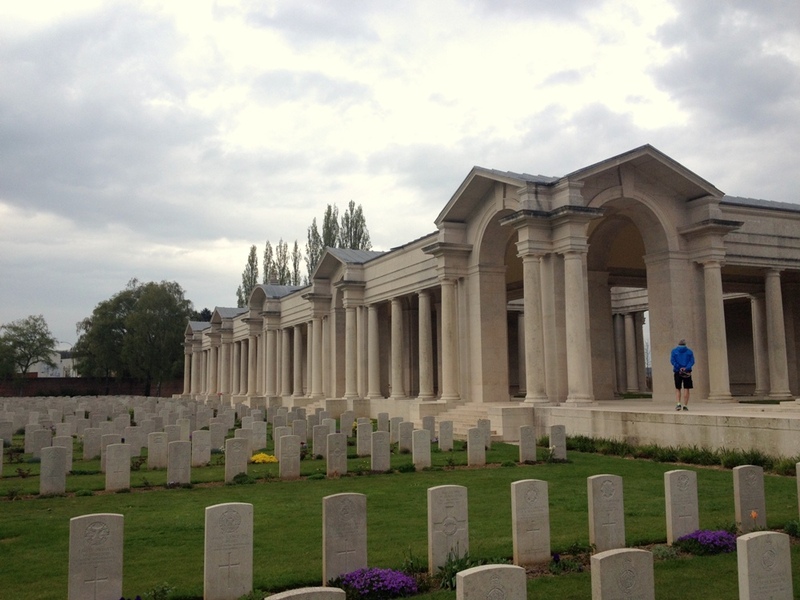 The sheer scale of men with no known grave from the Arras battlefields had the usual sobering effect. Being so close we popped into the Mur des Fusillés and paid our respects at the site where 218 French resistance and civilians were shot by the Germans in the Second World War. I have always found it an eerie place with a strange atmosphere all of its own. We then headed out to the Great War battlefields around Arras with the first stop the Point du Jour for a visit to the military cemetery and the graves of the 10th Lincolns men (Grimsby Chums) found in 2001 and the impressive 9th (Scottish) Division memorial re-sited next to the cemetery. After a picnic lunch in the cemetery we headed back into Athies and along to Fampoux. The village marked the point of furthest advance into German lines on 9 April 1917. We stopped at the sunken lane to look at the attack of the 2nd Seaforth Highlanders and 1st Royal Irish Fusiliers (10th Brigade, 4th Division) against Greenland Hill and Roeux on 11 April 1917. 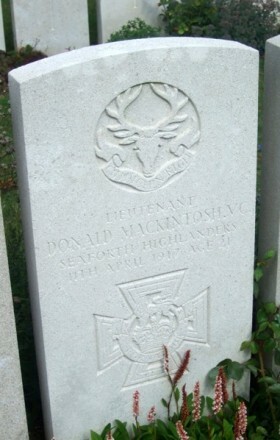 Whilst at the Sunken Lane Cemetery overlooking the sloping fields down to Roeux I told my group of Donald MacKintosh and the actions that earned his Victoria Cross. 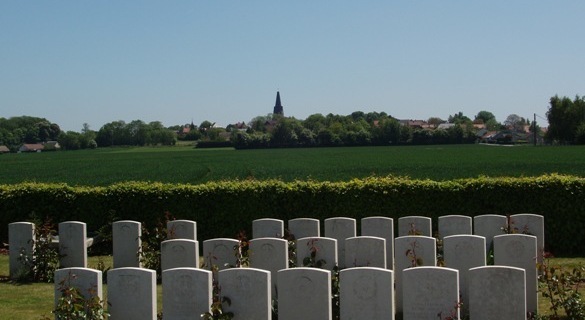 We then drive through Roeux past the site of the Chemical Works (now a Carrefour mini-supermarket) and around to Brown’s Copse Cemetery to pay our respects at MacKintosh’s grave. Back on the road we crossed the Scarpe and headed up to Monchy-le-Preux. 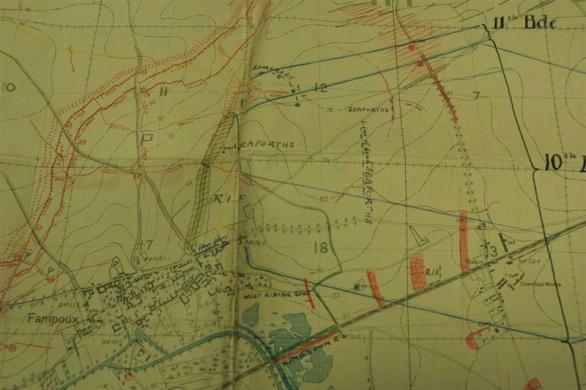 I pointed out the positions of various trench lines and explained about the catastrophic failure of the 3 May attack, the Third Battle of the Scarpe. 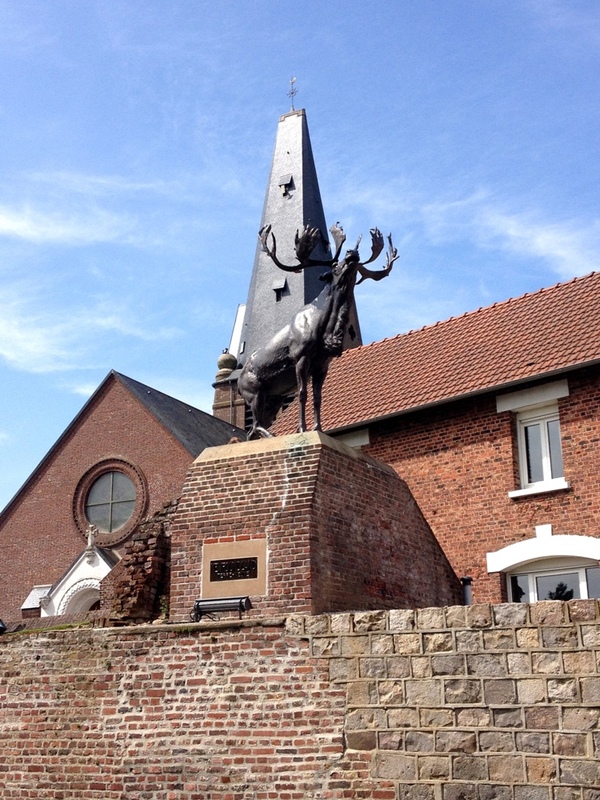 We then had a drive around Monchy, stopping at the stunning 37th Division memorial and the Newfoundland Caribou Memorial which is built on the top of a British artillery observation post constructed in August 1917 by 69 Field Company RE. Our day’s battlefielding was completed with a stop east of the village on Infantry Hill where I told of the disastrous 14 April attack by 1st Essex Regiment and the aforementioned Newfoundlanders. Both battalions were destroyed in carefully planned German counter-attacks – the first use of the new doctrine of ‘elastic’ defence. Monchy was at the mercy of the Germans and the situation was only saved by the quick thinking action of Lt-Colonel James Forbes-Robertson and a small group of men – all decorated for this action and known thereafter as the Heroes of Monchy. 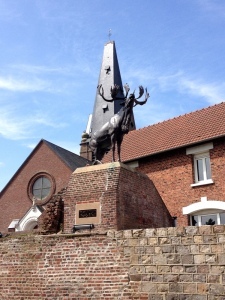 We had a pleasant walk up Infantry Hill to the Mound and then headed back into Arras to pick up my car and then headed down to the Somme for a welcome meal and good night’s sleep. The view of Infantry Hill from Green Lane. Bois du Vert sits on the horizon to the right of the picture. 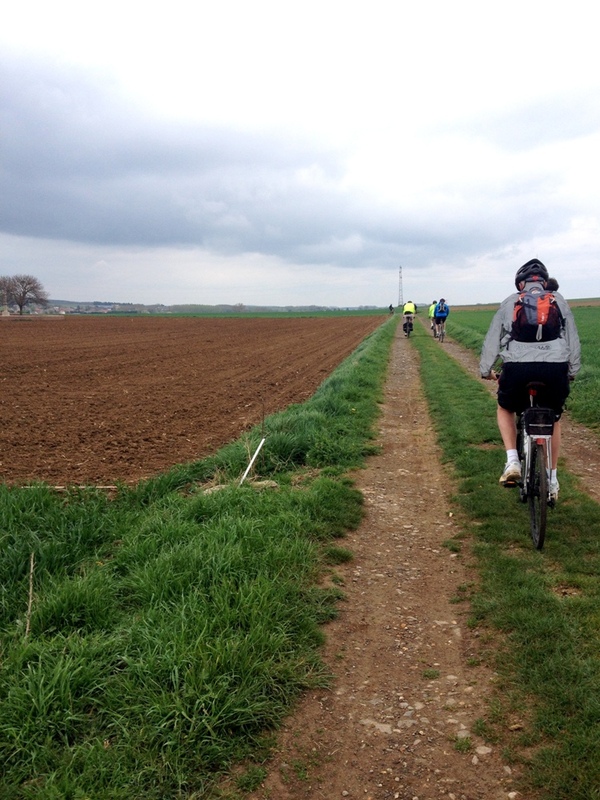 The next day was spent touring the 1916 Somme battlefield. Very much aware that one can only skim over the surface with one day around such a large and important battlefield we were up early to make full use of the daylight. After an explanation in the car park on the battle using various maps we set off north up to Serre, the most northerly point of continuous attack on 1 July 1916. En route we pulled the car in at the Ulster Tower for a view across the Ancre and an explanation of events in the northern part of the battlefield. The Gospel Copses at Serre were deserted and we had Sheffield Memorial Park all to ourselves as I explained about the failure of the attack and the losses incurred by the northern Pals battalions of the 31st Division. The entrance to Sheffield Memorial Park with Railway Hollow Cemetery in the background. 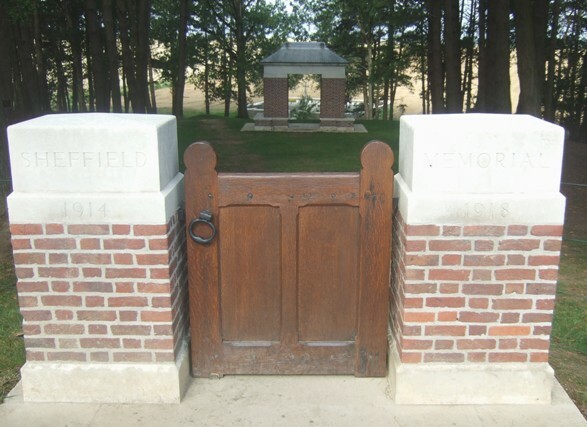 After some time in Railway Hollow Cemetery we stopped at Serre Road Cemetery No.2 (the largest on the Somme battlefield) and the across the Redan Ridge to Beaumont Hamel, and the infamous sunken lane, the jumping off point for the 1st Lancashire Fusiliers that fateful morning. We then retraced our steps and stopped for a pleasantly quiet walk around the preserved trenches of Newfoundland Memorial Park with its Caribou and even more imposing memorial to the 51st (Highland) Division, conquerors of Beaumont Hamel in November 1916. Our next stop was to the magnificent Thiepval Memorial to the Missing, a must for any battlefield visitor to the western front. Heading via Pozières of Australian fame we reached the Old Blighty Tea Rooms at La Boisselle for a deserved late lunch. The afternoon began with a detailed tour around the Glory Hole at La Boisselle and a good walk around the site looking at the craters and depressions marking the trenches followed by a stop at the unmissable Lochnagar Crater. The Glory Hole at La Boisselle. Overlooking the site of the Granathof. 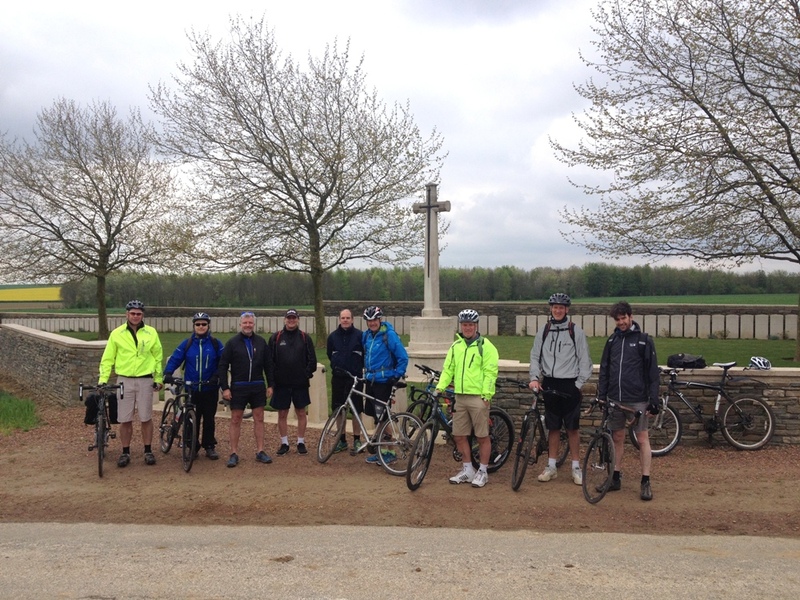 We then headed east through the battlefield, past Contalmaison, Longueval and Guillemont to the Cedric Dickens cross at Ginchy overlooking Leuze and Bouleaux Woods. 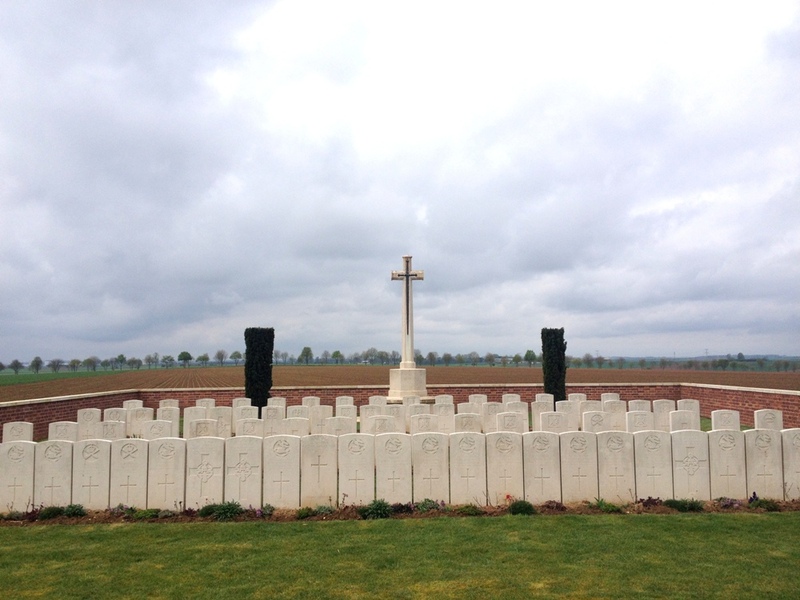 This was a special stop for one of the group whose grandfather had served with the 1/8th Middlesex Regiment and who had probably been in these very fields in mid-September 1916. Jack & John with Bouleaux Wood in the background. John’s grandfather served here in September 1916 with the 1/8th Middlesex Regiment. Our final stop of the day was to the site above Mametz of our successful archaeological dig for a Livens Large Gallery Flame Projector where I could stand my clients on the spot where the parts had been recovered in May 2010. Sadly we did not have time to all visit the Historial de la Grande Guerre at Peronne to see the temporary exhibition and salvaged projector parts as well as the full size replica but there is only so much we could do within the time constraints. “I would just like to say a big thank you for making our battlefield tour such an interesting and amazing event. Your knowledge of the area and what went on and where, is just incredible. 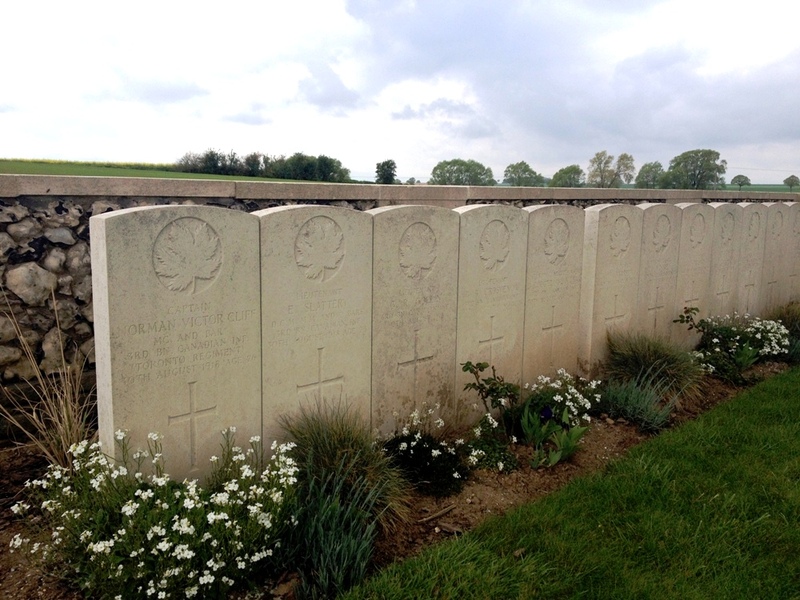 The tour was made that much better by the fact that you had researched my Grandfather’s service in the Middlesex Regiment and proceeded to show us exactly where he was and what he would have experienced almost to the day but 95 years ago. It made the hair stand up on the back of my neck! 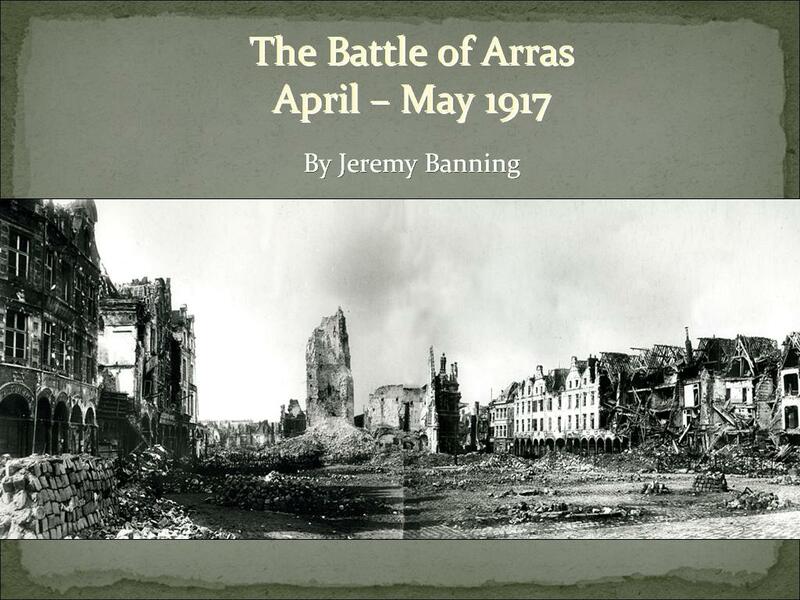 The talk was entitled “The Battle of Arras: April – May 1917″ and was well attended with about 45 people regulars plus my brother Mark Banning and his friend and regular battlefield companion Malcolm Sime. It was structured to not merely cover the battle but start with warfare in the Arras area in October 1914, look at the costly French actions of 1915 and then move on to British occupation in March 1916. The German attack against the 47th (London) Division on Vimy Ridge was touched upon and then I covered a basic backdrop to battle from the political and military standpoint and explained in detail the new German policy of ‘elastic defence’ to be brought into play for 1917. Moving through the Chantilly and Calais conferences I then spent some time on the German retreat to the Hindenburg Line (Operation Alberich) before exploring preparations for battle such as the tremendous work of the Royal Engineers. I also looked into French preparations, the actions of General Robert Nivelle and the extraordinary series of leaks and security lapses that marred the French pre-battle period. By this time half an hour had gone but I felt it important to set the scene fully and not merely delve straight into the battle itself. 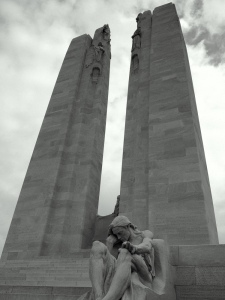 I structured the actual battle part of the talk by focussing on the First and Third Army fronts from north to south, starting with the Canadian Corps attack on Vimy Ridge before moving into what I always think of the main ‘Arras proper’ battlefield. Realising that no talk about the Battle of the Somme would neglect to work its way down the front line for 1 July 1916 I adopted the same structure – following each division’s success (or failure) as we moved southwards across the Scarpe and Arras-Cambrai road into Hindenburg Line territory until ending with the 21st Division at the south of the attacking frontage. Explaining the reasons for success in many sectors and failure in others I then worked my way through the battle focussing on stand-out actions. These included the capture of Monchy-le-Preux on 11 April 1917 and the destruction of the cavalry of the Essex Yeomanry and 10th Hussars in the village. 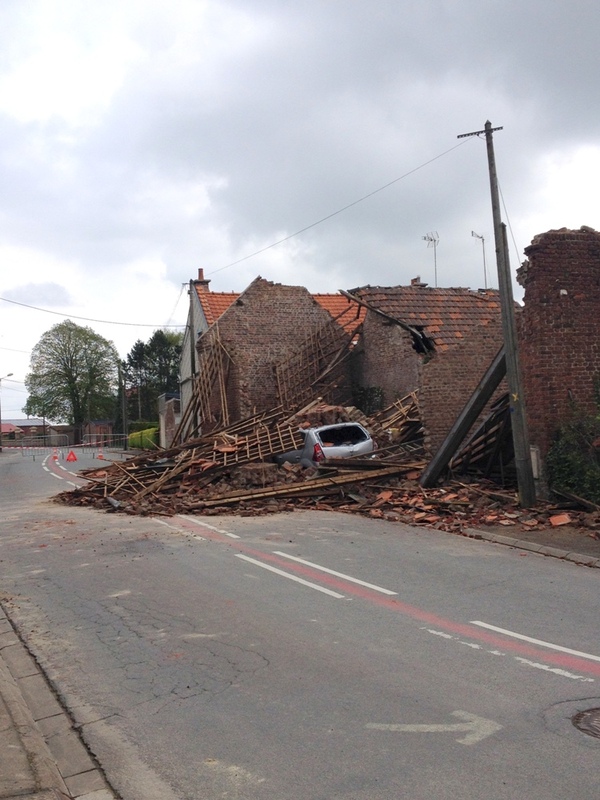 I also covered the attack by two battalions of the 10th Brigade (4th Division) towards the village of Roeux and the Chemical Works. 1/Royal Irish Fusiliers and 2/Seaforth Highlanders suffered grievous losses in the attack; the Seaforths attacked with 12 officers & 420 Other Ranks and their losses were all 12 officers & 363 O.R. This meant that a mere 57 men survived the action unwounded – and the objective wasn’t gained in any way. The beautiful Seaforths Cross on the Sunken Lane at Fampoux is a reminder of the men who attacked and suffered so much that day. I touched on the fighting at Bullecourt that day but felt that the disastrous actions around that particular salient village warranted a talk of their own. 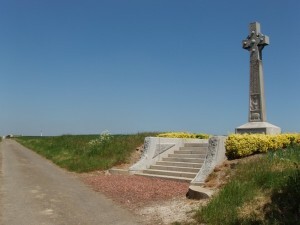 The next attack to be looked into was the attack up Infantry Hill by the Newfoundland Regiment and 1/Essex Regiment on 14 April 1917 – an attack that almost destroyed both battalions and which left the way open for the German reoccupation of Monchy. The day was saved by a gallant band of men led by Lt Col James Forbes Robertson, CO of the Newfoundlanders who organised a small group of men to run to eastern edge of village and open rifle fire. For five hours their fire held the Germans at bay until the village was relieved. All were decorated and became known as ‘The Men Who Saved Monchy’. I then worked through the month of April, looking at the failed French attacks on the Aisne and then explaining the movements of 23 April (Second Battle of the Scarpe) with particular emphasis on the fighting for Roeux and the Chemical Works by the 51st (Highland) Division. The battle was deteriorating against well organised and deployed German troops employing the new ‘elastic defence’ doctrine. 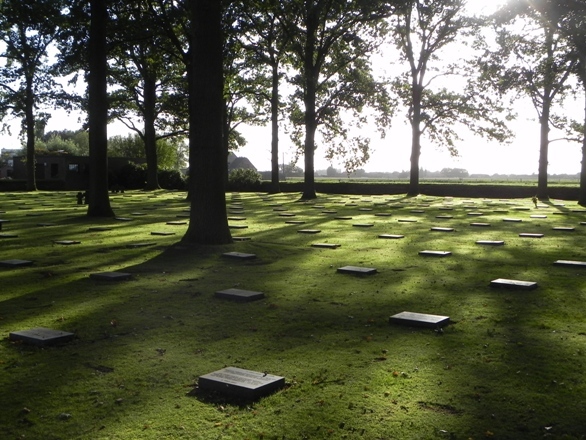 It was a dreadful time – Third Army suffered 8,000 casualties alone on the 23rd/24th April. I concluded with the finals stages of battle, the loss of Fresnoy and eventual capture of Roeux and the Chemical Works and for my last slide whilst talking about the men who had done the fighting I showed one of my favourite pictures. 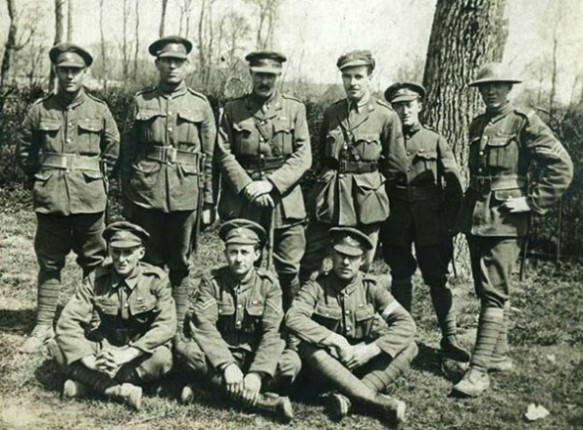 It shows a triumphant shot of a group of the 12/West Yorkshire Regiment in Arras celebrating their success of 9 April with captured booty. I was amazed when a man in the front put his hand up, saying he had spotted his grandfather in the photo! Apparently the only wartime souvenirs that his grandfather left were his medals and a copy of this photo. 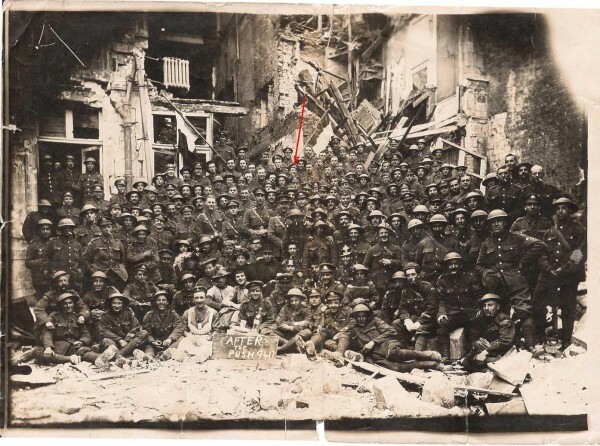 The man was 50496 Acting Corporal John Davison Johnson (marked with a red arrow in the photo) and I thank his grandson, John Johnson for this information – it quite made my night! All feedback received has been good and the Branch Chairman, Bridgeen Fox, wrote very warmly afterwards with her thanks. Her comments can be read here. 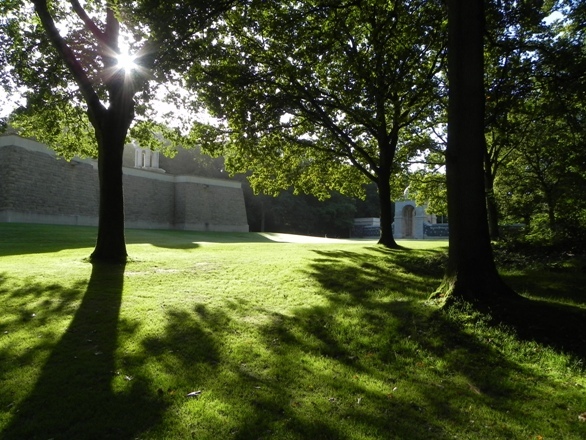 As she herself said, “it should have raised the profile of the battles of Arras and I hope it will have encouraged more people to explore the area”. When I have some time I will write a blog piece with detail about the 3 May fighting. My thanks to Geoff Sullivan from the wonderful ‘Geoff’s Search Engine’ for furnishing me with some tremendous statistics for that day. If anyone is intersted in hearing this talk then please contact me. I am speaking on this subject in Bristol in October – see here for details. For those with an interest in the battle our panorama book on the subject is available here. Alternatively, if you are interested in a battlefield tour to Arras then please contact me – I would be happy to discuss.